There was a minute there when I was all gung ho about making stuff inspired by Alice in Wonderland. There was a whole “Lewis Carroll’s Fever Dreams” collection that happened. In included a lot of partial mesh outfits, as I was learning how to model and rig things for Second Life. 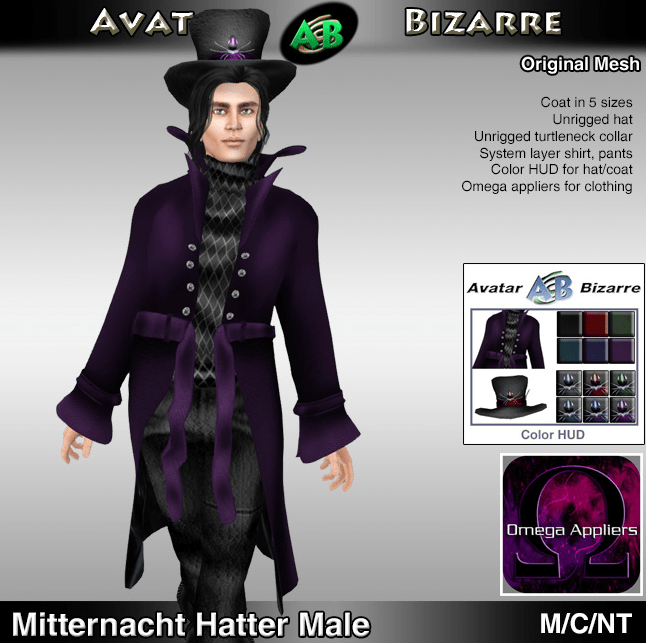 At one point, I probably made three or four different Mad Hatter outfits. 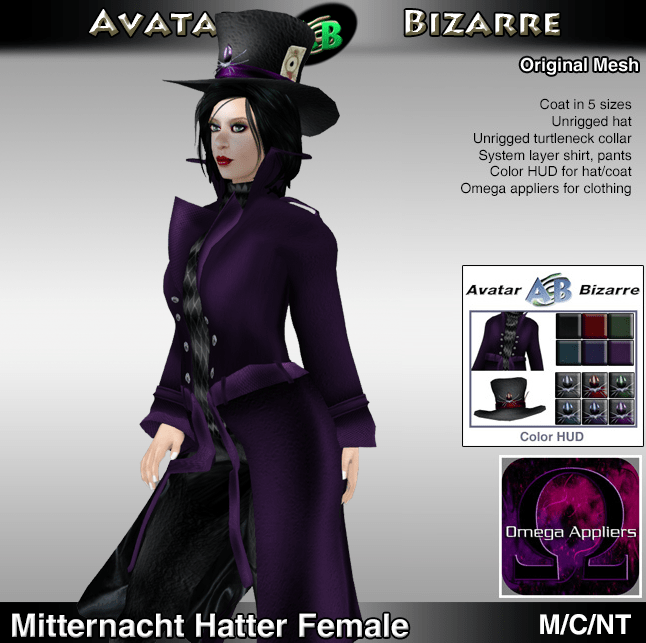 They were all different, but they all had this partial mesh thing in common, except for the original Mad Hatter outfit, which was all system layers and flexi prims. That one had a couple of versions, as I sought to improve things later on, and was far too reluctant to simply give up on the outfit altogether. The old system layer outfits can still look pretty good, but with the prevalence of all the zillions of mesh bodies out there, particularly Belleza, SLink, Maitreya, and others, these outfits kind of fell by the wayside, because mesh bodies cannot wear system layers without special applier scripts. But never fear! In a frenzy of “Oh hey, we have the technology; we can make it stronger, faster, better…” I acquired the necessary scripts and created some HUDs for mesh body clothing layers. The nice thing about OMEGA appliers is quite a lot of the mesh bodies out there are compatible. You only have to go out on the Marketplace and buy the particular relay for whichever body you wear.